The Rubbermaid 3064-01 2 qt. 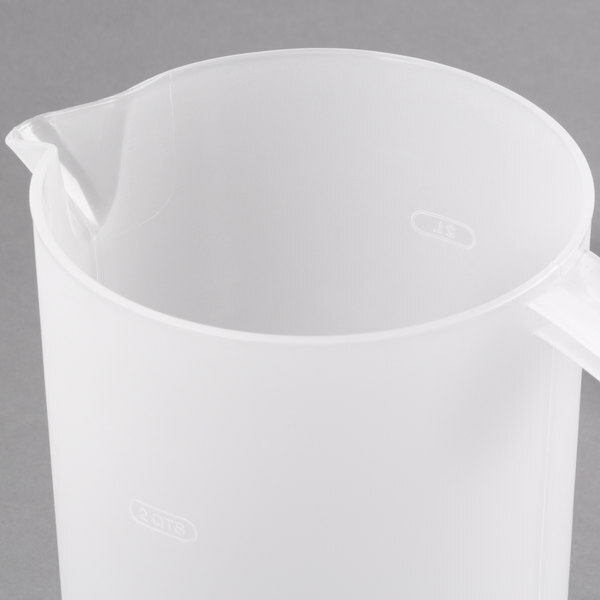 plastic pitcher features built-in mechanical mixing mechanism that makes it easy to blend beverages or create them from powders or mixes! It has a rugged polyethylene construction and a wide, open top for easy cleaning. 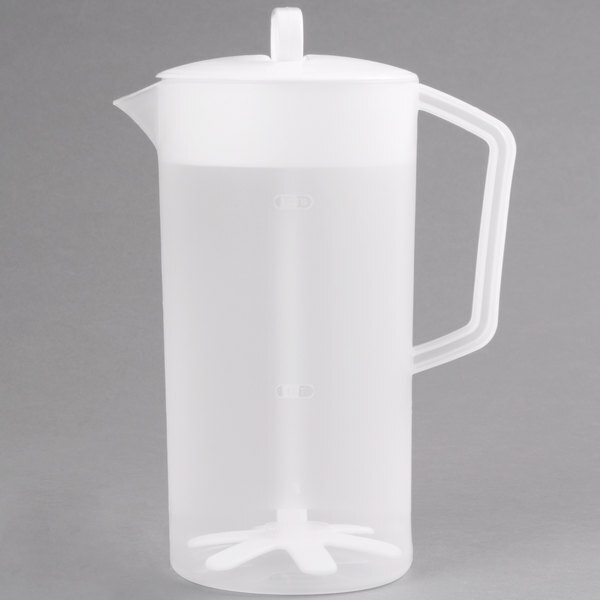 This versatile, translucent mixing pitcher is great for serving juice, iced tea, and water. It's also useful in the back-of-house for creating, storing, and pouring batters. Designed for years of useful service, this 2 qt. 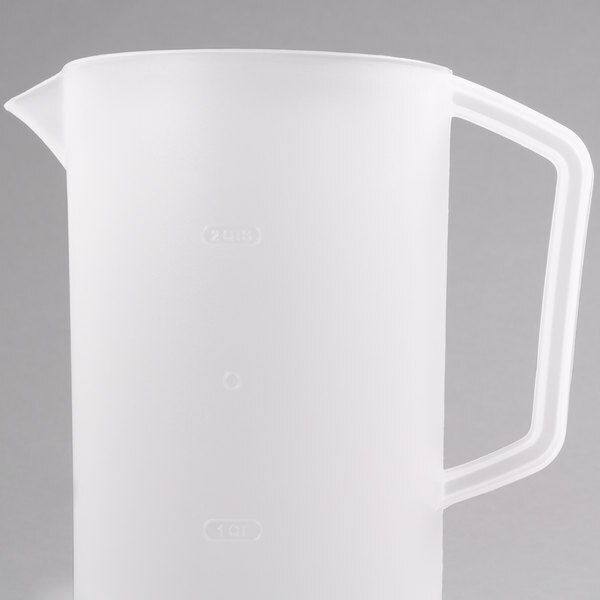 pitcher can withstand temperatures from -20 to 160 degrees Fahrenheit. 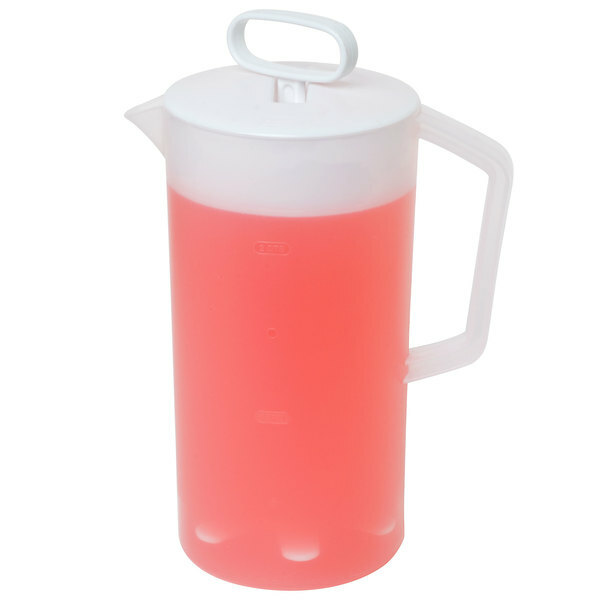 These plastic mixing pitchers are great for pulpy beverages like lemonade or orange juice. When the pulp settles to the bottom, you can easily pump the handle and it mixes it all back up. This was a great idea, but one that failed miserably. It doesn't stir effectively for heavier products (frappe mix, chocolate mix, etc.) the lids also broke. Might work for something lightweight, like teas, but extra space needed for top, lack of true stirring ability, and breaking give it one star. First we just used this at home, but when I had an event and needed sangria it came in really handy. The white plastic on the stop is very sturdy. The best pitcher you will ever purchase! It makes mixing drinks SO much easier. I give it a mix before every time I pour and it's so easy to use! This pitcher changed our world for the better. We have been struggling for years with our juices for smoothies naturally setting over time,. It was a challenge to stir them up well when we were in a rush. This pitcher truly eliminates that problem. 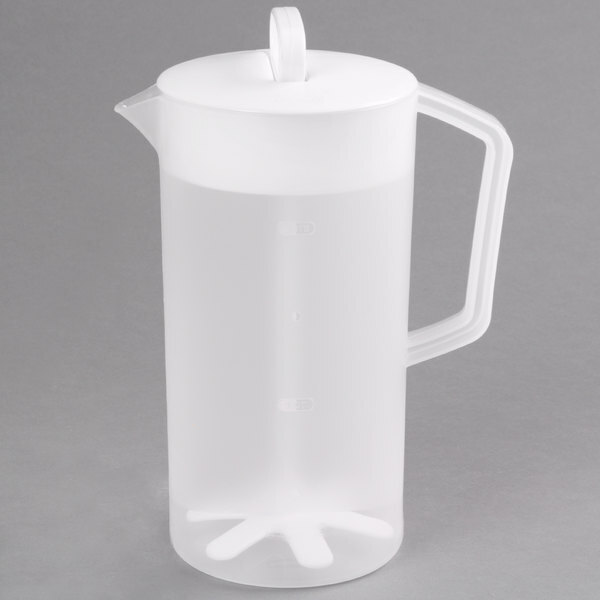 This pitcher is perfect to store mixed drinks. The handle turns and moves up and down mixing the drinks without having to shake the whole pitcher. It is very durable, and nothing like those weak plastic pitchers. I am very pleased. One of the best choices! Cannot believe how fast this pitcher arrived! Made some homemade lemonade and love how sturdy the pitcher is. The stirrer will be great for when the product settles after sitting in the fridge. Wonderful item and service yet again! These are great - we use then in the Front of House for easy pouring of juices and teas for the day. The top allows you to mix fresh squeezed juice up so every pour is perfect. For our local charity fund raisers, we needed several mixing-types of pitchers. These work great! Pour in your liquids, spin and push the handle up and down, great mixing, even frothing. 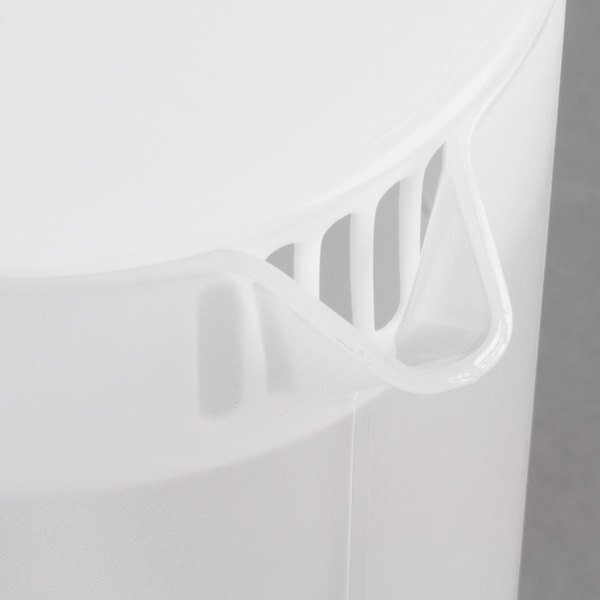 The Rubbermaid 2 Quart Plastic Mixing Pitcher is great for any use. I use my Rubbermaid Plastic Pictures for mixing instant tea's coolaids , just add water and powder close lid and mix handle machanisem up and down a couple of time,s works well easy to clean. It mixes well and pours really well, but the mixing arm doesn't always reach the very bottom of the container, leaving some drink mix powder behind. 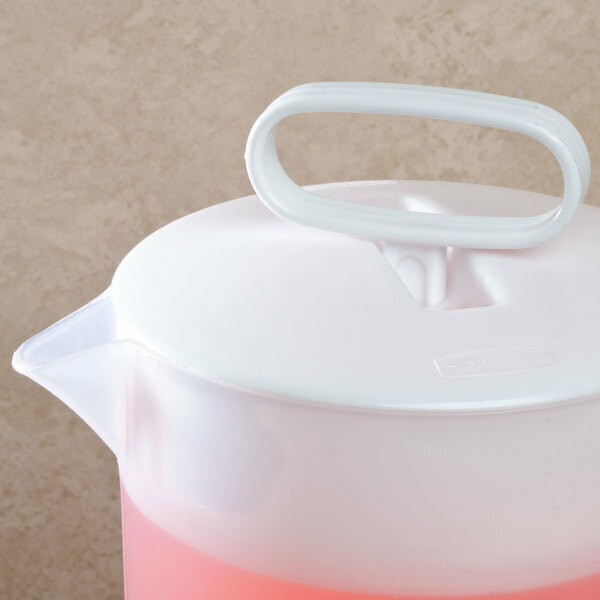 Very convenient pitcher because it has a stirrer built right in and it fits nicely in the refrigerator door. I've never seen this type in the stores. At first I was skeptical about this pitcher due to the fact that it has the mixing rod built-into the lid, but when I received it and started using it, the mixing rod was no issue to me. 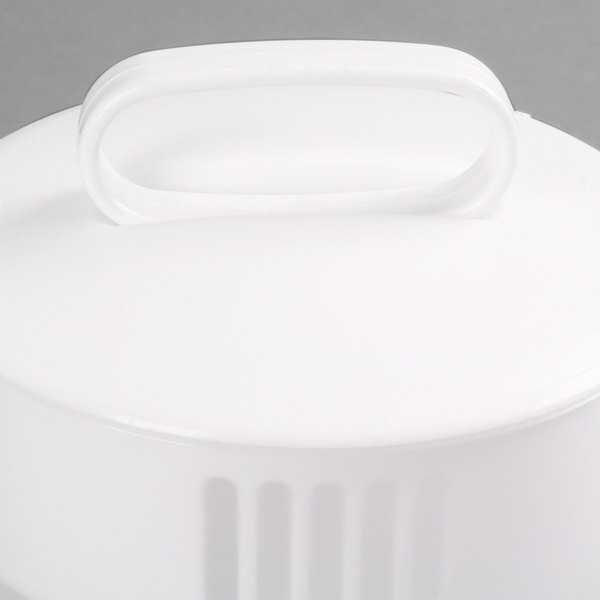 The pitcher is made from thick plastic that can hold boiled water in it without deforming. 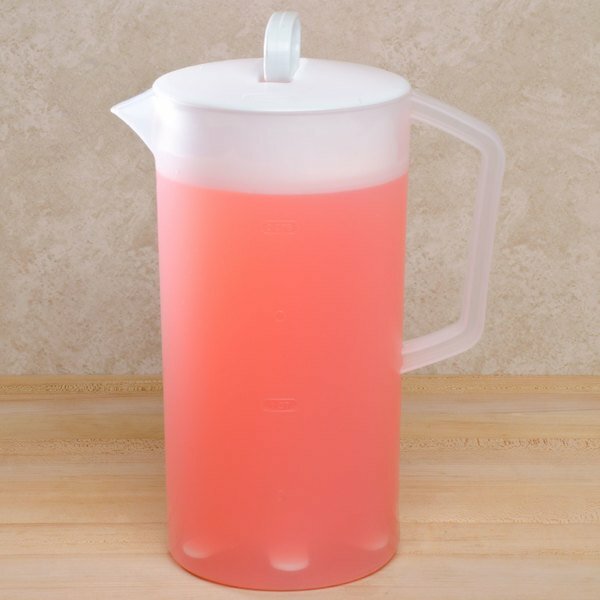 I use this pitcher to make iced tea and lemonade. I find that the stirring rod is very useful for clamping down the tea bags when brewing the tea. The mixing rod/agitator also works well but be careful when the pitcher is full and not mixing it too vigorously, since the liquids will tend to pour out of the beaker/spout. Great pitcher. The mixer is great for sweet tea and also for stirring ice into beverages. I bought 3 of these and I use them constantly. They clean up well and still look like new after many months of use. I love this pitcher! When I make lemonade I do not have to wash a seperate spoon. It is all in one. A must for tidy kitchens.